Chinese Mesona or Black Cincau is a very popular and sweet drink in China and neighbouring Asian countries which yields the Black Jelly. The plants are boiled in water containing potassium carbonate. The juice is cooked and then cooled into a gelatinous consistency. This jelly-like material is cubed, mixed with water, syrup and flavourings and consumed as a highly unique tasty and refreshing drink, especially during hot weather. It has a mild and slightly bitter taste. Best to be served chilled. 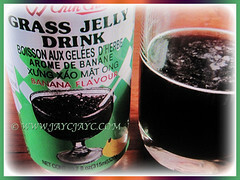 Black Cincau is often canned and sold in Asian markets as Grass Jelly. Botanical Name: Platostoma palustre (syn. : Mesona chinensis, Mesona elegans, Platostoma chinense). 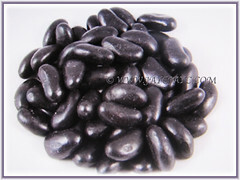 Common Name: Grass Jelly, Black Jelly, Chinese Mesona, Chin Chow, Black Cincau, Leung Fan in Chinese. Origin: Native to India, Myanmar and Indochina. It is widely cultivated elsewhere around the globe. Plant type: A perennial and herbaceous plant. Features: Platostoma palustre is from the genus Platostoma that consists of about 44-46 accepted species of flowering plants. 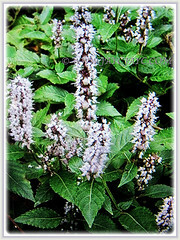 It is a perennial and herbaceous plant with trailing stems that are between 15-100 cm long. The evergreen and petiolate leaves are simple and narrowly ovate to almost circular. 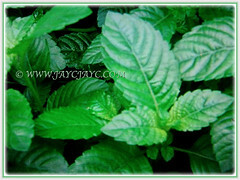 Green coloured leaves are 2-5 cm long and 0.8-2.8 cm wide. They are serrated or toothed at the foliar margin and oppositely arranged along the stems. 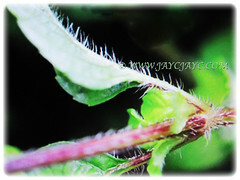 Its stems may be hairless, pilose or finely covered in short and stiff hairs. Ornamental flowers are coloured white, light blue to purple or lavender. They are 3 mm long and are arranged in a whorl-like inflorescence where flowers appear to surround the stem. Flowers are arranged in branched clusters known as panicles. The panicles are either erect or pointed upwards at an oblique angle. Eventually, the flowers will be followed by black and elongated fruits that are known as nutlets. Culture (Care): Platostoma palustre or Grass Jelly grows easily with least maintenance. Moisture: High to medium water needs. Soil: Consistently moist and well-drained soils. It is sensitive to drought. 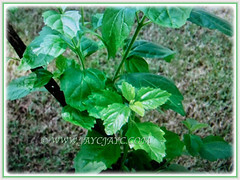 Others: Best to cultivate this plant on flat ground or areas with a slight slope. Feed once fortnightly with a fertilizer for foliage plants as it encourages growth of more leaves which leads to better production of Grass Jelly. Generally free from serious garden pests and diseases. For subtropical and temperate regions: Hardiness: USDA Zone 10a-11. Platostoma palustre or Grass Jelly is a tropical and tender perennial that is suited for growing outdoors year round as well as planted indoors. In non-hardy regions, grow the plant in a container to easily overwinter indoors. Propagation: Easily propagated from seeds, by dividing the rootball or from herbaceous stem cuttings. 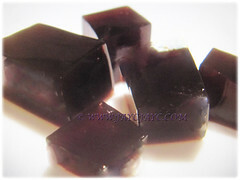 Usage: Platostoma palustre or Grass Jelly is primarily used in making grass jelly. Ideal to be grown as groundcovers. The plant is processed by harvesting all the aerial portions above the root. The portions are then partially dried and piled up in order to allow them to oxidize until they have darkened. After the oxidation, they are then thoroughly dried for sale. Leaves has been used to make jelly desserts and beverages by the Chinese for centuries. Sometimes, the Grass Jelly is mixed in various kinds of desserts, such as air kacang and cendol. In Singapore, the dried leaves and shoots are sold in Chinese medical halls. 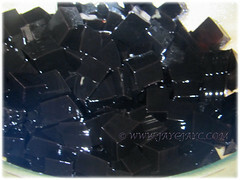 Grass Jelly, a popular local dessert, is prepared by boiling the dried shoots in water with sugar and agar and allowing the strained liquid to set.Grass Jelly or Cincau Tea is thought to have a cooling effect on the body. According to a lab-based study by Yen in 2003, the plant extracts have strong antioxidant activity. 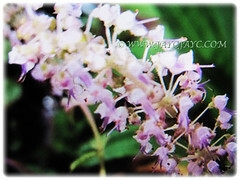 In Chinese folk medicine, the plant is used as a herbal medicine for liver disease, hypertension, diabetes and joint pain. Herbal jelly is believed to have medicinal properties by many Asian cultures. One such medicinal property is an alternative to relieve heartburn because of its content of carbohydrates, calcium, phosphorus, vitamins (A, B1, C), and water. It can also ease stomach pains, nausea, and indigestion. Food relief refreshing thirst is also beneficial for health because there is soluble dietary fiber. The water soluble fibers in the body can bind to sugar and fat which is useful to prevent diseases such as diabetes mellitus, heart disease and stroke.